Feeling Official. 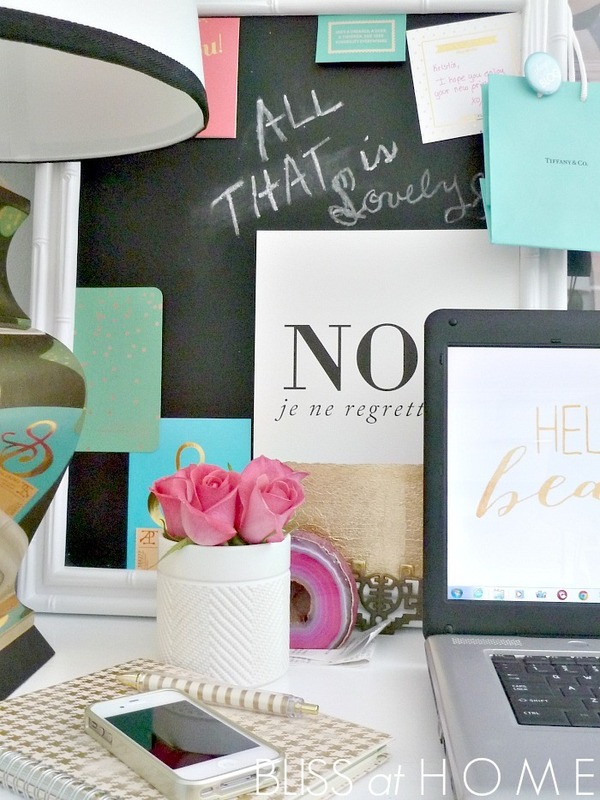 Desk Decor Ideas & Inspiration. Up until a week ago, I did not own a desk. I don’t know if I ever have. In college, I was notorious for studying in bed and so far that’s where all of my blogging has taken place. Of course I’ve had thoughts of going to a cute local coffee shop to get some work done but I never quite make it out of bed. It really is my favorite place in my apartment. I bought this beautiful desk and was really excited to get it home. Who knew what a task it would be to actually get it delivered and set up. I even had to do a whole room re-arrange to prepare a place for this massive desk. It would be a whole other post to cover the details of how it all came together. It took a lot of work and a lot of help (HUGE thanks to my brother) but it’s finally here. What next? Time to decorate. Ever since I had the opportunity to purchase her I’ve been too excited to start searching for decor pieces. (insider info: in the gifts & home business all furniture is referred to as “she/her”…things you learn on the job) I’ve pulled together some desk decor as inspiration. perfect for the post-grad 20-something. a little encouragement in French + fun chalkboard detail. gold details. polka dots are a must. grey + green & pops of pink. love. fresh flowers & lucite accessories. house of harper’s orange office. my favorite! As I launch my styling & concierge business – Consulting by C. – this desk will be the epicenter of all of the magic. 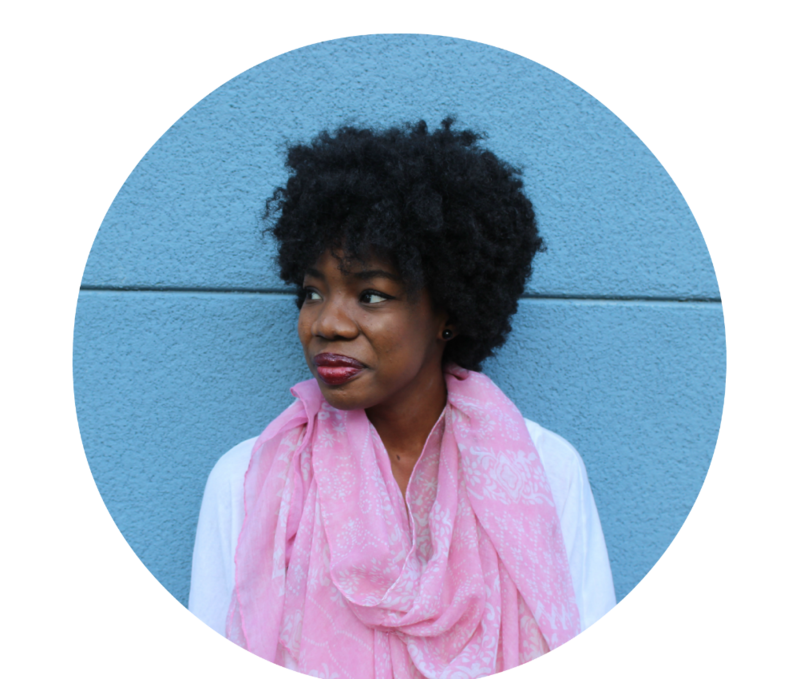 I feel like an official blogger now. Something about having a desk/work space makes a girl feel legit! 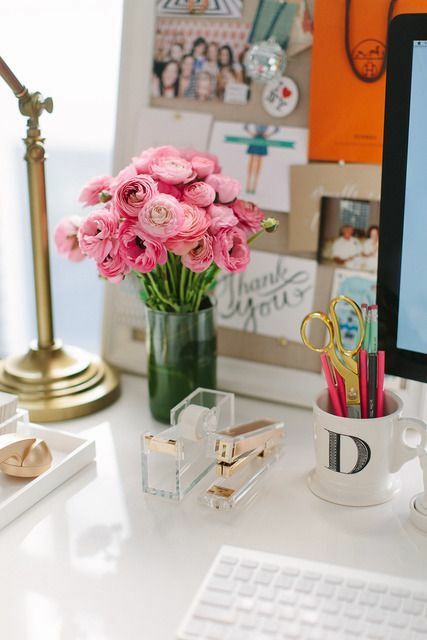 Follow my Pinterest page where I’ll be adding more inspiration for my desk. Any other tips & cool desk ideas to share? Chic Back to School Essentials. Gallery Wall Tutorial + Tips. The Block is Haute Travels. Atlanta Weekend. 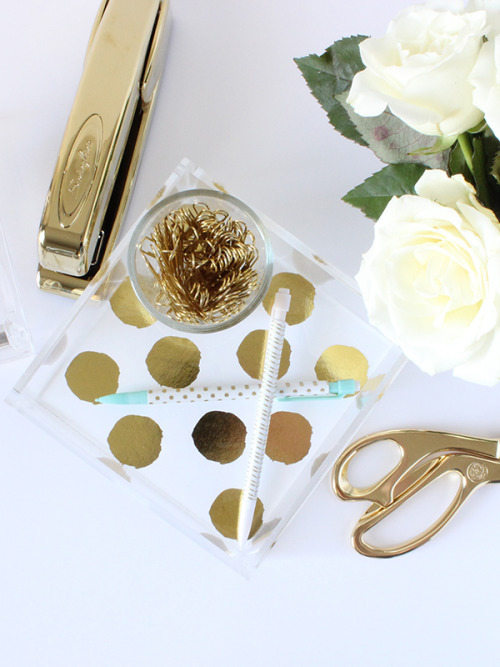 Amazing desk decor ideas! Thanks for sharing! Hi there!!! Thank you so much for stopping by my blog and commenting. Your little online space is gorgeous! And what a lovely desk!!! Good luck with all of your fashion/stylist goals. You definitely seem like you’re off to a great start! I’ve been needing some desk ideas, I’m obsessing over these!!! Thanks for sharing! I love all of this work space inspiration! Makes me want to redo my home office! Ah i love simplistic pretty decor for desks, somehow my cork board seems to end up over flowing with inspiration and ideas! I agree. I love clean spaces but it’s so hard to keep a clean desk!